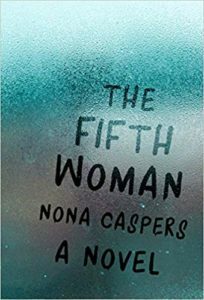 The Fifth Woman by Nona Caspers is a novel composed of twenty-three short fictions. These individually titled pieces, while they stand alone beautifully and occur across different times, spaces, and even conceptions of reality, are unified by the central conceit of their narrator grieving the death of her partner. Caspers’s prose unifies form and content in a spectacular way as she writes the facts of grief, doing justice to both its devastation and transcendence, the sublime surreality it bestows on the world through the mere fact that one must continue to live in it. It is the quotidian and surreal aspects of grief and memory that accumulate to form the backbone of this novel. The hands of the blanketed woman were noteworthy, long and muscular. I began waiting for her hands to appear, and when they did, I leaned forward and thought about how she had achieved them. Michelle also had remarkable hands. I’d watch her rifle through a drawer, her long fingers like antennae. It was difficult for me to believe that her hands were dead. The strange yet apt comparison of Michelle’s fingers to antennae reveals to us the brilliantly realized synecdoche of the narrator’s mourning; obviously her love is attentive and all-encompassing, but it is moments like these that generously give us the painfully bright, clear, cropped images held onto in grief. I think of Michelle’s deadness as an open parenthesis — most of the data has vanished: the way her hands felt on my face, the smell of her skin and hair, what she loved or didn’t love…For a moment my pulse drops — not grief, but the absence of grief like a missing rib. The absence even of the memory of grief. The betrayal of her memory — its eventual inability to retain even that which she so desperately wants to keep — is a recurring and devastating theme; yet Caspers’s tone is not quite that of an earnestly delivered elegy. Her prose behaves like memory itself in that it careens from association to association. In the hyperreal writing of isolated parts and objects, she sloughs off the heavy materiality of the things being described for the grace of that which they evoke. We see, repeatedly, how the narrator’s grief ruptures her reality, as she crafts multiple outcomes for various objects and events in her daily life. Some examples are crucially mundane, and tied to memories of Michelle, such as the occurrence of ants in their apartment kitchen: “The ants were winding their ribbons around the table or were washed up under our sponge and drowning in the kitchen sink.” And in “The Gun,” the narrator finds a revolver in a park and takes it home with her: “If Michelle had been alive, she would never have let me keep it. But, if she had been alive, this story would never have happened.” But others have less to do with Michelle specifically and are merely tinged by the fact of her death in the narrator’s hopes to reverse it. In one particularly explicit instance, “The Horse,” she describes her work on her thesis, reading animals in contemporary short fiction, and she is overwhelmed by one short story in particular in which a horse drowns. She is haunted by the imagery used by the author and reflects on her project. Ultimately the narrator, after much internal anguish over the use of fiction and her own relationship to animals, rewrites the ending of the story in full, altering it so the horse is saved, yet none of her conflicting questions about herself and her aims are solved. What becomes most important throughout the novel, however, is that the narrator’s memories are easily familiar to us because they are so touched by the quotidian, as when she conjures an image of Michelle slurping leftover milk from her cereal bowl. We are privy to an intimate experience of mourning as Caspers writes her narrator moving in and through the most ordinary daily tracks in her grieving process. The world keeps moving in unthinkable, unreal ways through and around the tragedy of her partner’s death, and in her exhausting, athletic grief she describes things in curious and mutated language, as in “The Dog,” where she is visited by a puppy-shaped shadow every afternoon for a summer. There is something remarkable about Caspers’s ability to pair the steadfast nature of a dog with something as inherently illusory and temporary as a shadow, all the while evoking the narrator’s scrupulous self-awareness: “I couldn’t locate where the dog came from…I know this lack of source makes the dog unreal, but the dog was as true and constant as anything else in my apartment.” It may be that we are only able to grasp the narrator’s grief in select moments that slip through the cracks of the mundane. In turn, everything becomes understated as shadows become reality and vice versa; the loyalty of a dog is seen only as a shadow and the permanence of loss is seen only at the kitchen table. Delaney Adams is a bookseller living in New York.